An elegant, stress-free finale to a special dinner. Pannacotta always impresses and this simple recipe is quick to get to the chilling stage. Change the fruit according to the season. Roasted rhubarb or a berry compote made with frozen berries are some alternatives to fresh raspberries. Put the sheets of gelatine into a bowl and cover with cold water. Split the vanilla pod lengthways and scrape out the tiny seeds. Put the double cream into a pan with the vanilla seeds and the pod. Warm without bringing to the boil. Remove the cream from the heat, add the sugar and stir to dissolve. Remove the vanilla pod. Squeeze the water out of the gelatine leaves and add to the warm cream. Stir again. Set aside to cool, then add the yogurt. Pour the cream into a 22cm savarin mould and chill for at least 4 hours. Meanwhile, place the raspberries in a colander and rinse under running water. Put them in a bowl and squeeze the lemon juice over. Sprinkle with 1 tablespoon of sugar and stir to combine. Cover the bowl with cling film and refrigerate until needed. After 4 hours plunge the savarin mould into very hot water for a couple of seconds, being careful the water doesn’t actually touch the panna cotta. Put a serving plate upside down on top of the mould and quickly invert. The ring of panna cotta will slide effortlessly on to the plate. Take the raspberries out of their macerating liquid and place in the middle of the panna cotta ring. Put the liquid into a small pan, add 50ml of water and the remaining 1 tablespoon of sugar. Bring the liquid to the boil over a medium heat and cook for 3-4 minutes until the sauce thickens a little. 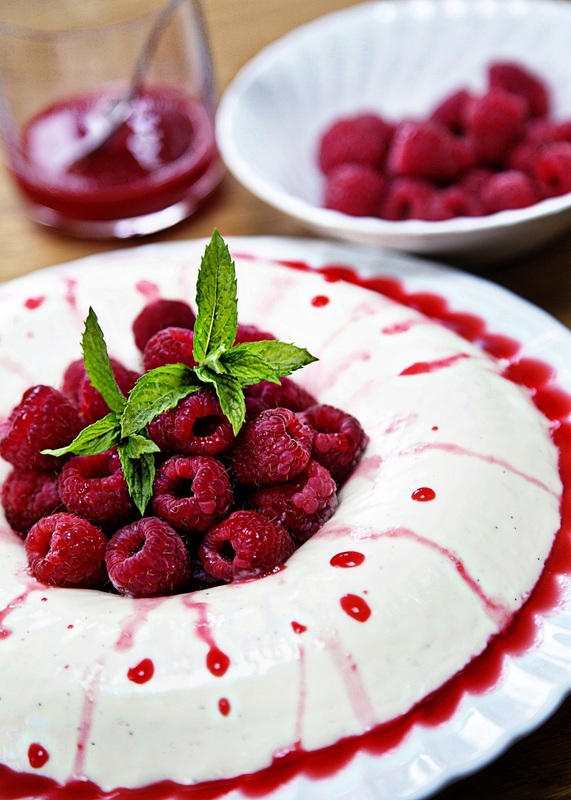 Pour the reduced sauce over the raspberries and panna cotta and refrigerate until needed.